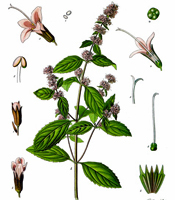 Rich in menthol and derivatives, Peppermint essential oil is used in perfumery, gastronomy, particularly for its refreshing effects. The organic components of its formula make it an antimicrobial, fungicidal, insecticidal and insect repellent oil. This oil has also demonstrated its effectiveness to make rodents and other pests flee.